Sharon Langley is wearing a white cotton dress with a big rounded collar and a shiny ribbon. She has matching white booties that are topped by folded-over socks. She’s only 11 months old and it’s her first time on a carousel — in one picture she has her thumb in her mouth and she’s looking with some confusion at her dad. Her father, bespectacled Charles, is wearing a pinstripe suit with a kerchief and his large hand is covering hers on the pole of the spotted pony. On the horse next to them is a little boy with a buzz cut who knows the routine. He’s clearly just jumped on and is ready to go. There’s no hesitation. It is a vignette we’ve seen dozens of times on dozens of carousels. A little girl’s first ride on a big carousel — this is the first and last American merry-go-round to feature sixty jumping horses four abreast. Except there’s more to this vignette. Sharon is the first black child to ride that carousel and she and the spotted pony are a symbol of the civil-rights movement in Baltimore. The fight to desegregate the United States started in earnest in the late 1940s. In the mid-’50s, Rosa Parks and Brown vs. the Board of Education stirred the embers of the movement in the deep South. Farther north, local students and religious and community leaders in Baltimore staged non-violent demonstrations to protest against the whites-only policy at Gwynn Oak Amusement Park. They fought for equality at the park for a decade. “Segregation is un-American,” read one of the protest signs, held aloft by a man with a pastor’s collar, seen in a photograph by the Baltimore Sun. Police hauled them off — four officers to each protester — and chucked them in jail. The next morning, the protesters sang I Woke Up This Morning With My Mind On Freedom. In August 1963, hundreds of thousands of people marched on Washington and Martin Luther King Jr. gave his iconic “I have a dream” speech. That very day, forty miles north, Gwynn Oak opened its gates to the entire community. Sharon and her dad rode the carousel. Gwynn Oak had been segregated since its opening in 1893 but would be open to everyone for only 10 years. It closed in 1973. The carousel — including the Freedom Rider — was moved to The Mall in the 1980s and sits a short walk from where King made his impassioned speech. 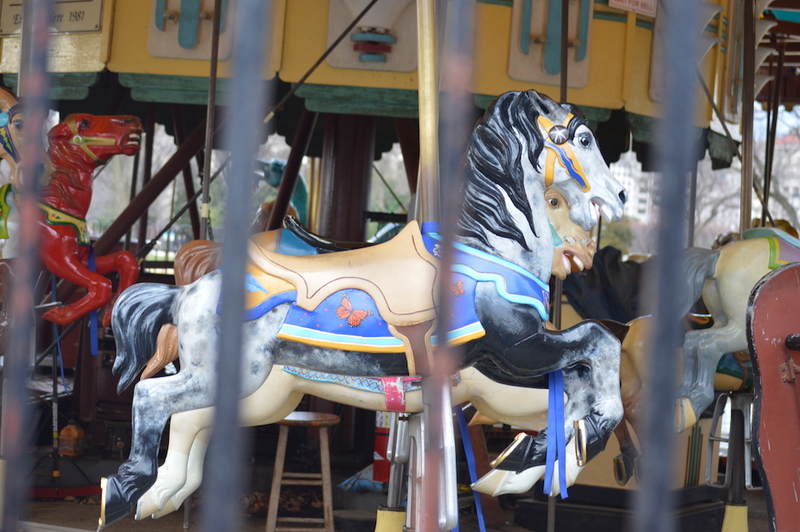 When we visited the carousel on New Year’s Day, it was playing Auld Lang Syne. Previous Pumpkinferno and other after-dark near-adventures in Cornwall, Ont.